Oklahoma is known for many famous people and things, including Will Rogers, corn as high as an elephant’s eye, Kristin Chenoweth, wind that comes sweeping down the plain, Hopalong Cassidy (William Boyd), Belle Starr, football, basketball, Mickey Mantle, Johnny Bench, surreys with a fringe on top, Reba McEntire, Garth Brooks, and Maria Tallchief, among others. But not, to my knowledge, for a ballet company. Until now. Tulsa Ballet stormed into the Joyce Theater this past week with the force of a tornado – something else for which Oklahoma is famous. I saw the company at Friday evening’s performance, and was thoroughly impressed with its crop of energetic and engaging young dancers. While I have some concerns, and didn’t find each of the three contemporary ballets on the program equally successful, at this point – getting to know the company for the first time (although this is its sixty-first year) – these are relatively minor quibbles. Artistic Director Marcello Angelini apparently brought his entire company on this visit, its first in nine years, as well as an enthusiastic young cheering section that may have included dancers in its second company and/or from its school. But the dances he selected for this engagement limited the breadth of the program to relatively brief examples of contemporary ballet that, although sufficiently distinctive, all shared a similar energy level and structure. Regardless, after the first piece on the program I found myself so swept away by the caliber of the company’s dancers that they could have presented anything and I probably would have found reason to enjoy it. I haven’t seen very many dances choreographed by Columbian/Belgian choreographer Annabelle Lopez Ochoa, but of them, Shibuya Blues, which opened the program, is by far the best. It’s interesting, intelligent, accessible, and ultimately, for its novel way of presenting a relatively tired subject, thoroughly entertaining. Although not a narrative ballet – in many ways it looks abstract – Shibuya Blues is decidedly about something: an outsider trying to find her way, and a connection, in a bustling metropolis. Although the metropolis is certainly Tokyo, the ballet’s appeal applies universally, beyond the dance’s specific location. For those as uninformed as I was, Shibuya is a “Ward” (city) of approximately six square miles within Tokyo that’s home to two of the world’s busiest railway stations and is Tokyo’s major shopping, entertainment, and nightlife center. Think Times Square on steroids. And reportedly – and not surprisingly – it’s a major destination for the area’s millennials. I didn’t know any of this before I saw Shibuya Blues – and didn’t need to know it. Shibuya Blues showed it to me. But I anticipated something similar based on the dance’s musical credits, the initial piece being Intro/Tokyo by Richard Beggs, from the film Lost in Translation, an insightful, lonely film about lonely strangers in a strange city – Tokyo – in what I now understand to have been the Shibuya Ward. Structurally, following a brief “prologue,” Shibuya Blues begins with a crowd scene (which I immediately translated in my mind into a New York City subway or transit hub area – except it looks squeaky clean and everyone is outfitted in virtually identical “upscale” business/blue-dominant costumes, so it had to be somewhere else). But I thought also that it might be a bustling street location within which commuters and visitors purposefully swarm 24/7 on their way from one place to the next. I learned, again after the dance, that Shibuya has an area in front of the main transportation hub, a “pedestrian scramble crossing” (“Shibuya Crossing”) in which streetlights repeatedly bar traffic to permit pedestrians to fill the area. Within this area (or coextensive with it) is a popular meeting area called Hachiko Square – named after a dog that waited for its owner to return to the station from which he’d departed … for some 12 years. This must have been the dance’s specific, but unstated, location. There was no statue of a dog on the stage in Shibuya Blues as there now is on Hachiko Square, but everything else about it had an air of nonspecific authenticity. Between the costume design by Danielle Truss and the lighting by Les Dickert, there’s an intentional uniformity to it, and the sense of a confined space. And, like the tempo of a metropolis, the pounding pace of much of the curated score is relentless. The story is neither complicated nor unusual. After wistfully staring into the distance, presumably toward the place from which she came (that “prologue”), Outsider (that’s the character’s name) attempts to fit into a strange new world of anonymous people preoccupied with getting to wherever they’re going. She tries to adapt to their mannerisms and idiosyncrasies, repeatedly fails, but eventually finds her way. Simple. But as presented and executed, I found it fascinating. Lopez Ochoa has managed to create individuals within the mass, to isolate them and give them character even amid the uniformity. The movement quality, generally, is agitated/purposeful (staccato, jerky, angular movement), and the crowd’s members are oblivious to the Outsider, who gets pushed and bumped and ignored much like a pedestrian on a New York street, where walking is a contact sport. Lopez Ochoa isolates the featured dancers within the whole while not in any way changing the dance’s character or its flow. But Shibuya Blues is also remarkably lyrical, and the fact that it’s a ballet, with dancers confined to the street/stage but always seeming to aim to be somewhere or to do something that’s on a “higher” level, provides a multi-textured experience appropriate for an environment that is more multi-textured than it appears to be. I particularly loved the way Lopez Ochoa has crafted scenes in which the Outsider observes, and briefly interacts with, two isolated couples, creating imaginary and fleeting – and somewhat heart-wrenching – pas de trois in the process. The entire cast was exemplary, and the featured pairs of couples, Jaimi Cullen and Joshua Stayton, and Jennifer Grace and Jonnathan Ramirez, danced exquisitely, expansively, and sensually, albeit also somewhat (intentionally) distractedly. But the dance belonged to tiny Maine Kawashima, her waif-like character possessed of gentle but steely determination. Dressed differently from the others (in white), Kawashima successfully communicates Outsider’s frustration and persistence (she just has to find a way to fit in), vulnerability, intelligence (she’s learning not just new behavior, but a new “language” of interaction), finesse and fluidity, and ultimately, relief. She consistently steals your heart from the moment she first appears on the stage until she’s securely found her connection (with another outsider, as in the film) and the piece, its story concluded, abruptly ends. She can command the stage on her own (as in a lonely solo), and can stand out in a crowd. And she’s only a member of the corps. Helen Pickett’s Meoal (Among) is also well-crafted and the movement quality is unusual and complex-looking, but to me the piece has limited choreographic and emotional significance. Meoal, a Tulsa Ballet commission (as is Shibuya Blues), is choreographed to six songs (instrumental) by Icelandic composer Johann Johannson. Like Shibuya Blues, a key to the piece’s intent may be gleaned from the source of the instrumental songs: four of them are from the 2016 film, Arrival. But if Pickett was attempting to replicate what I understand to be Arrival‘s plot (a linguist’s attempt to communicate with aliens in order to avoid a war based on mutual ignorance), Meoal doesn’t succeed. I did see the development of some sort of language, but that, and a considerable amount of weird-looking movement, are the only unstrained connections to the film that I sensed. Much more significant to me is the dance’s relationship to the music’s sound. Based on the songs used here, Johannson’s music consists of layer upon layer of muted, echo-y, relatively high-pitched expressions, a chorus of frozen angel voices. Taking my cue from the composer’s nationality, what I heard was that of persistent wind that might have emanated from within, or around, a glacier. Pickett’s choreography reflects this, but it also reduces it to something unforgiving rather than icily celestial. One man (Daniel van de Laar) initially emerges from the wings with a long “kneeling” stretch/lunge utilizing only his legs; his torso remains vertical and rigid. Eventually, the other dancers in the cast repeat the movement and join him. I suppose that this could have been a visualization of aliens exiting from a spaceship, but to me, and with the “cold” ambiance of the music, the icy costumes by Emma Kingsbury (although some of the women wear distinguishing gauzy partly-colored skirts, for reasons I couldn’t discern), and Dickert’s lighting as if illuminating a clouded, frozen sky, it looked as if the dancers’ rigid torsos had been suddenly freed from a block of ice and their legs were the first parts of their bodies to unfreeze. There’s also a sense of personal exploration: the dancers discover their bodies’ extremities (particularly their hands) as if they’d never seen or felt them before. And although I also sensed an effort to learn to communicate, it was with each other, and subsumed within the larger context of self-discovery. Pickett may have intended to illustrate the attempts by linguists (maybe they’re the skirted women) to communicate with “native” aliens, but, as presented, that’s a leap – or lunge – I’m not able to take. The difficulty I have with Meoal, aside from being unsure of Pickett’s intent, is that it doesn’t go anywhere. Eventually the “lunge” motif disappears (but, inexplicably, reappears later), replaced by twitching angularity (those bones had been frozen for too long) and a sense that the dancers were using their arms (after they warmed enough to move) to slice through air that was only a few degrees less frigid than the ice. The dance isn’t monolithic – there are formed patterns that come and go for no particular reason (perhaps these are allusions to the film that eluded me), and there are occasional pairs of dancers isolated from the larger group who formed icily romantic connections. And the piece isn’t lacking in some interesting moments, albeit moments that look somewhat frozen in time. The cast of ten (Tomoka Kawazoe, Regina Montgomery, Madalina Stoica, Grace, Kawashima, Cavan Conley, Rodrigo Hermesmeyer, Chandler Proctor, Shuhei Yoshida, and Ramirez), plus van de Laar, carried off the choreographic complexities well. Glass Figures, which had its world premiere on Tuesday’s opening night, is yet another dance based on a Philip Glass composition (Concerto for Violin and Orchestra No. 1) – but it’s the first (aside from Jerome Robbins’s Glass Pieces) that doesn’t look like it was created by Twyla Tharp. Resident Choreographer Ma Cong’s ballet is purely abstract, with repeated image sequences that reflect the repeated melodies in Glass’s score. The dance begins with a male dancer under a dome of light, and ends with a pair under the same dome. In between is a movement kaleidoscope involving various permutations of the sixteen dancer cast. Somehow, the choreography avoids making everything look the same (as Glass avoids making every melody sound exactly the same), and the dancers, two lead pairs (Stoica – the only principal dancer in the program – and Conley, and Grace and Stayton), two featured pairs (Minori Sakita and Hermesmeyer, and Kawashima and Yoshida), plus a 4/4 corps, carried it off beautifully. The women were particularly outstanding, but I must also recognize the men. Where regional companies tend to have a plethora of highly competent female dancers but a dearth of equally competent males, Tulsa’s male dancers handled the partnering intricacies and athleticism with commendable skill. Based this program, Tulsa Ballet demonstrates what I’ve been observing for several years – the caliber of the dancers, reflecting the training received from an increasing number of dancers who themselves are graduates of major schools and companies worldwide, has advanced to the point that high quality ballet performances can be seen in any nook and cranny of the country. 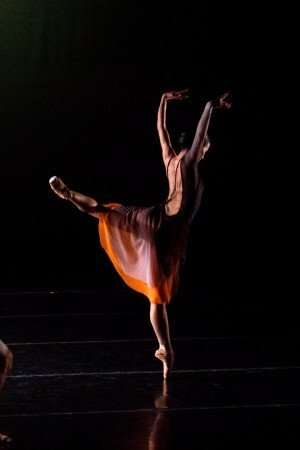 However, as noted at the outset, the program doesn’t show everything that needs to be shown to demonstrate what a ballet company and its dancers can do. Even though each of these dances is a ballet, there was no classical ballet with which to gauge the dancers’ abilities. The Tulsa Ballet dancers all have extensive classical ballet training and performing experience, and I note that the company begins a full-length production of Ben Stevenson’s Cinderella next week, will present Angelini’s The Sleeping Beauty next year, and in recent prior seasons has presented Swan Lake (by Angelini), Don Quixote (by Anna-Marie Holmes after Petipa), John Cranko’s Onegin and The Taming of The Shrew, and of course The Nutcracker. I can’t speak to the quality of these productions, or how “classical” each of them (aside from Cranko’s dances) may actually be, but an excerpt from one or more of them might have provided some indication of the company’s depth. But at the very least this program has whetted my appetite to see Tulsa Ballet and its young dancers again. And next time – since the Oklahoma tornado quickly morphed into a New York snowy nor’easter – maybe they should come in the spring.